On October 24, 2013, a panel of industry and municipal experts convened at Toronto City Hall to discuss urban wood utilization initiatives, challenges, and solutions from across North America. Click on the panelists to view their presentation. On September 18, 2013 the Toronto Chapter hosted our third Session of the LEED Breakfast Series. Gathering for another delicious breakfast at the Royal York Hotel, building owners, managers, real estate developers, and other green professionals learned about what it takes to achieve LEED Platinum for new and existing buildings. Our speakers from Halsall and Enermodal examined the 'rule of thumb' LEED Platinum performance requirements that owners can reference, and discussed how easy is it to transition from LEED C&S to LEED EB:O&M Platinum. Stay tuned for the final session of the LEED Breakfast Series coming up on December 6 at the Shangri-La Hotel! The CaGBC Greater Toronto Chapter Gala and Awards Program, which occured on October 16 at the Arcadian Court, was a huge success! Congratulations to all of our award winners! On September 11, 2013 Chapter Members and green building supporters set out to explore the revitalization project of Waterfront Toronto and watch the sun set aboard the Norther Spirit! This lively evening included a waterfront tour, dinner, great music, and an amazing view of Toronto's skyline. Continue reading to view photos from the event. 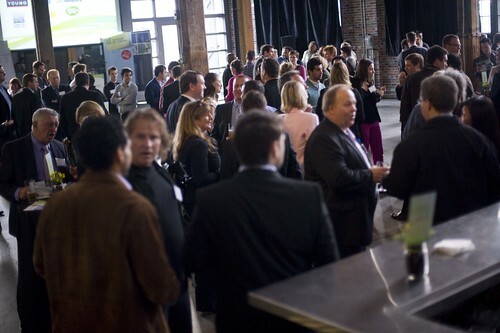 On April 30, 2013 over 175 people joined us at the Steam Whistle Roundhouse to welcome spring and celebrate green building. The event launched Green Doors Open, an initiative to engage the public and building professionals in green buildings in their communities and across Ontario. We invited select green buildings to present in our Building Blitz - a concise, fast-paced and engaging presentation format in which presenters showcase their buildings in under 2 minutes. 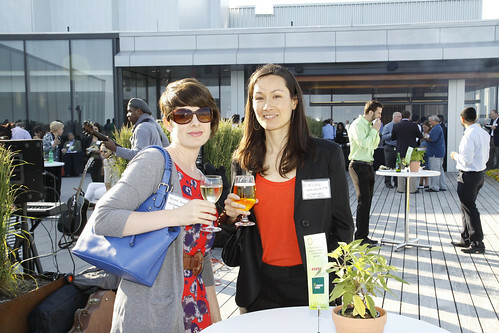 On June 18, 2013 over 140 people joined us on the green roof of the beautiful, newly constructed, George Brown Waterfront Campus to ring in the summer. Highlights of the evening included included delicious local food, live music and a special member's tour of the Waterfront Campus. Continue reading to view photos from the event. 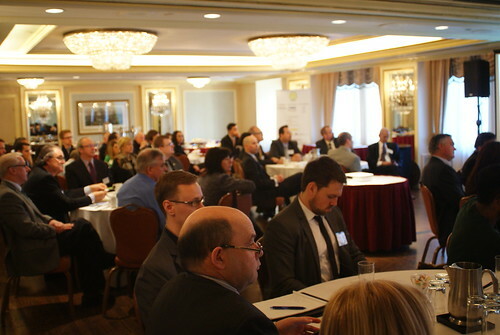 On April 3, 2013 the Toronto Chapter hosted the first session of our new LEED Breakfast Series. Over one hundred building owners, managers, real estate developers, and other green professionals gathered at the Royal York Hotel for a delicious breakfast and an informative presentation by Mark Hutchinson, Director of Green Building Programs at the CaGBC. The theme of the session was "LEED Certified, Now What?" and the following questions were addressed: How do you manage the goals and metrics included in your policies? What are the expectations for getting your building re-certified? What guidance does CaGBC have in this area? Don't miss out on Session #2 - LEED + Performance: How strong is the connection? on June 19, 2013. On June 19, 2013 the Toronto Chapter hosted the second session of our new LEED Breakfast Series. Over one hundred building owners, managers, real estate developers, and other green professionals gathered at the Royal York Hotel for a delicious breakfast and an informative presentation by Chris Pyke, Vice President of Research at USGBC. The theme of the session was "Green Building & Performance: The Emerging Era of Data Driven Practice" and the following questions were addressed: How does GBIG work? What data does it include? What is the data telling us about the connections between LEED certified buildings and performance? How will / can this data be used going forward? On March 5, 2013 the Chapter hosted a Lunch & Learn in collaboration with the Ontario Tire Stewardship. The theme of the presentation was Local Ontario Recycled Tire Building Products: Meeting Sustainability Objectives for Heavy-Use Facilities. This lunch and learn discussed the properties of products made from recycled tires (commonly referred to as tire-derived products or TDPs) and opportunities to meet sustainability objectives for heavy-use facilities such as schools, municipal sites, hospitals and sports and recreation sites. The presentation provided an overview of TDP applications and design strategies that can be utilized to help achieve sustainable building certifications and meet evolving building code and green planning and development standards in Ontario. With the aid of indepth case studies, the attendees were provided with practical guidance on specification, sourcing, use, maintenance and end-of-life considerations for tire derived materials, as well as insights into technological advancements and emerging applications. On November 29, over 50 Chapter Members joined us after Construct Canada to discuss the hot topics the green building industry is facing as we move into 2013. We explored our region’s top issues and projects in the green building sector through a series of tailored break-out sessions. Each group was moderated by a subject matter expert to lead and deepen the conversation about where our region is at the end of 2012, and in which direction we are heading. There was a light buffet dinner available with a cash bar. The event was free for Chapter Members, and $15 for Not-Yet-Members.